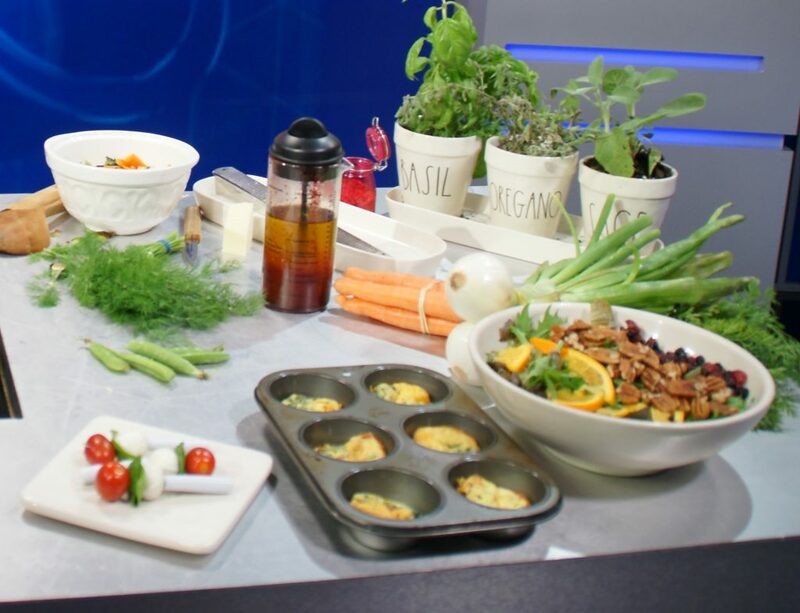 Andria and I created some of our go-to favorite recipes when FoxTV asked us to do a special on Culinary Medicine, but we started creating those recipes years ago. 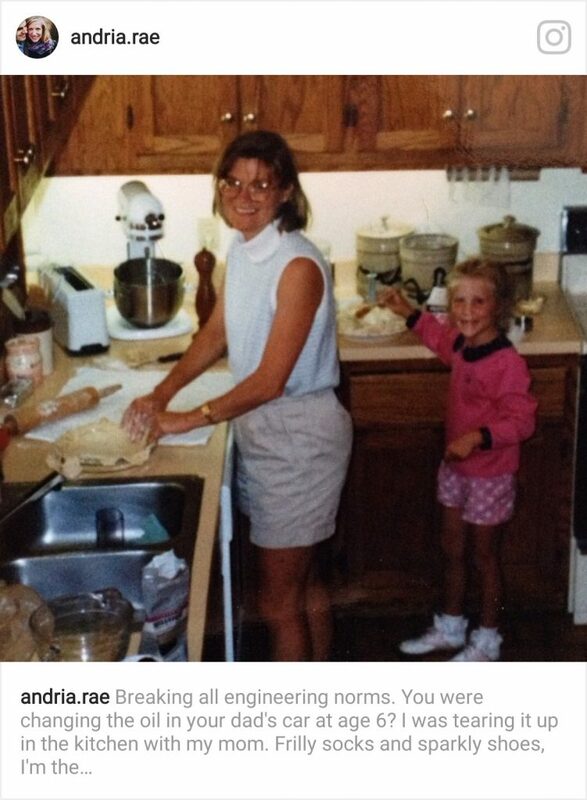 Andria is an engineer for Whirlpool and it is fascinating to think she was using a KitchenAid stand mixer when she was little and now she is designing KitchenAid appliances. She was a great little cook at 4 and she is a great cook now, but as Andria said on FoxTV, we have all walked in the door after a busy day and wondered, “What can I fix for dinner?”. It is a daunting task even for the best cooks some days, but imagine if you have limited cooking skills. Culinary medicine is all about knowing how to put healthy foods together to share with family and friends. If Andria and I can teach someone to cook, they will be able to eat healthier foods and that is where disease prevention all starts. One of the entrees we made was a salad which is easy to put together when you have great fresh produce. This one starts with kale. It has lots of nutrients but they can be a bit hard for the body to absorb. One way to increase absorption is to chop it really fine and to add a dressing that contains oil. 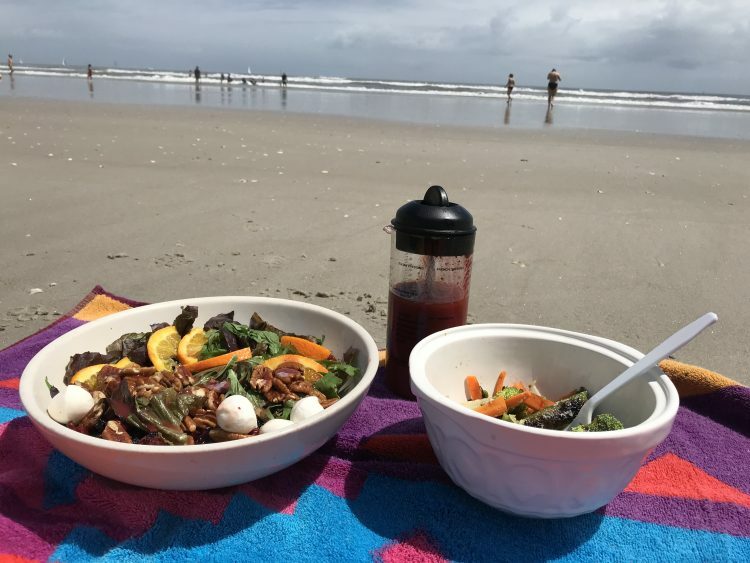 The oil in this dressing helps increase the absorption of at least 7 different nutrients in greens in this salad according to researchers at Iowa State University who found that a spoonful of oil makes vegetables more nutritious. Wendy White, the lead researcher on the project said that it makes less difference what type of oil. The added oil aided in absorption of alpha and beta carotene, lutein and lycopene – two forms of vitamin E and vitamin K. The oil also promoted the absorption of vitamin A, the eighth micro-nutrient tracked in the study, which formed in the intestine from the alpha and beta carotene. Place kale in food processor and process about 1/2 minute or until coarsely chopped. Add toasted pecans and dried fruit in a serving bowl. Combine all ingredients for dressing, mixing vigorously with a wire whisk until smooth. Drizzle dressing over kale mixture and refrigerate until serving time. This salad is especially good when given time to stand for an hour or more. Garnish with shaved Parmesan cheese. Vegetables fresh from the garden contain probiotics that aid in digestion of everything else that you eat. Probiotics have been important in the diets of people since the beginning of time. Probiotics are also found in Dukkha ingredients such as dill, mint or thyme. Dukkha is an Egyptian blend of nuts, cumin, mint and other herbs and spices. It is wonderful sprinkled over your favorite stir fried vegetables. Dukkha can be found in specialty stores or substitute other favorite vegetable seasonings. A dry saute pan can be used to toast the spices. A little heat creates slight chemical changes that brings out the spices flavor. In a wok, cast iron pan or saute pan, heat oil slightly and stir-fry onion until translucent. Add garlic and stir-fry another minute. Add carrots, cabbage and pea pods. Stir fry about 3 to 4 minutes or until tender-crisp. Toss with Dukkah or other favorite seasoning. Dukkha is an ancient Egyptian Condiment. This ingredient list is long, but the spice adds such a great flavor, you will be so glad you tried it. Use as a dip for bread with olive oil. Use as a seasoning for grilled or stir fried vegetables. The individual spices in Dukkha have so many nutrient properties that it is impossible to list them all. The key thing to remember is that variety is not just the spice of life, it is the best kind of nutrition of all. Eating a variety of vegetables, herbs and spices increases the micro-nutrients available which your body needs. Some specific micro-nutrients are known as important for good health and in future research it is likely we will find even more reasons to eat a variety of herbs and spices. Heat a cast iron skillet over medium heat. Add pistachios and almonds, toasting for 1-2 minutes, stirring frequently until toasted and golden (remove quickly from heat if they start to burn). Turn the heat off and add sesame seeds and star anise, stirring frequently for a few minutes to toast as the pan cools down. Pour into a bowl, and set aside. Next, heat the cast-iron skillet again over medium heat. When hot (after just a few minutes), add the coriander and cumin for about 30 more seconds, or until they start to pop. Pour these into another bowl, separate from the nuts. 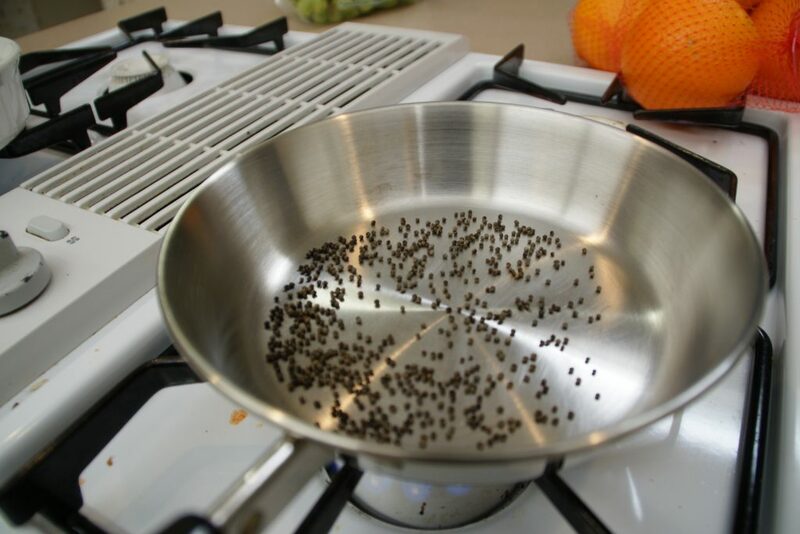 Return the pan to the heat and toast the nigella seeds and peppercorns for 1 minute, adding the cardamom seeds the last ½ minute. Add those to the bowl of fennel, cumin, and coriander. When the spices have cooled, transfer the bowl of spices to a spice grinder, food processor, or coffee grinder (if you use a coffee grinder, make sure you have cleaned it out first!) and pulse until the mixture is as coarse or fine as you would like. Pour the ground spices into the bowl of nuts and seeds, and mix with a fork until it is thoroughly combined. Store in an airtight container for a month or so, or store in airtight container in freezer for up to 4 months. Enjoy with olive oil and bread, salad, or stir-fried vegetables. 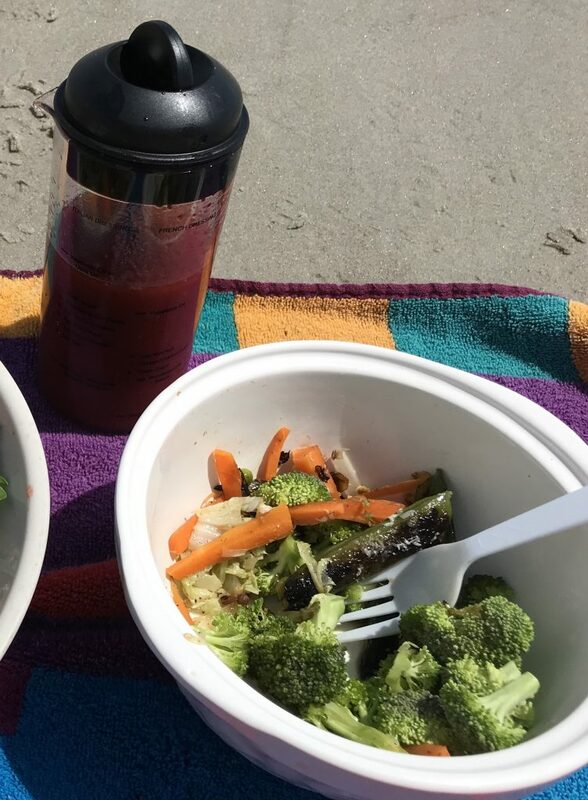 These vegetables with just a touch of a special blend of seasonings tasted so good for our beach. outing. Many of the nutrients in vegetables are easier to absorb when the vegetables are lightly steamed. Cooking the vegetables to just the right doneness is the key. Over cooked vegetables or vegetables cooked in an excess of water will have more nutrient loss than just cooking the vegetables until they are bright in color. Combine all ingredients in a mixing bowl and mix until eggs are blended with cheese and other ingredients. Coat a small muffin tin with non-stick cooking spray. Pour about 1/4 cup of egg mixture in each muffin cup. Bake at 350 degrees for 20 to 25 minutes or until set. Serve warm. Pasta and simple ingredients inspired by Italian Caprese make a drizzle of balsamic vinegar taste like a gourmet condiment, which it is. And it is also nutritious. It ages in wooden barrels where it ferments for years and sometimes decades to develop a distinctive flavor. But that fermentation process means that balsamic vinegar is full of gut healthy probiotics. Just one more of those foods that are full of flavor and nutrients. Prepare pasta according to package directions. While pasta is cooking, saute garlic in oil for about 30 seconds. Add tomatoes and cook over medium heat until softened, about 3 minutes. Add balsamic vinegar. Cook until slightly thickened about 2 minutes, stirring constantly. Add broccoli to pasta the last minute of cooking so it turns bright green. Drain pasta. Add sauce and stir in basil. Add salt and pepper to taste. Garnish with cheese.